Amazon’s Jeff Bezos made it very clear when he announced the high-end Kindle Fire HD on Thursday: the company is gunning for Apple’s iPad, the tablet market leader by a long stretch. The previous generation of Kindle Fire cost half as much as an entry-level iPad. But the $499 price of the new 8.9-inch Kindle Fire HD with 4G LTE matches the third-generation iPad’s starting price tag. It’s a clear challenge. But can Amazon really hold its own against Apple? 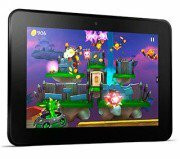 Amazon looks at the Kindle Fire HD as a media consumption tablet for books, movies, magazines, newspapers, music, and apps. Bezos said Amazon wants to make money when people use their devices, not when they buy them – a clear dig at Apple, which makes some of the biggest profits in the industry from hardware sales. For these reasons, the Kindle Fire HD won’t be able to replace the iPad as a computing and work/business device, so the competition between the two companies isn’t in this arena. Amazon seems to have gotten most of the details right with the 8.9-inch Kindle Fire HD as a high-end media consumption tablet. It boasts dual stereo speakers with Dolby Digital sound, a first for a tablet, which is a far cry from the iPad’s single speaker. The Kindle Fire HD has a slightly smaller display at 8.9 inches, but it keeps the pixel density up with a 1920-by-1200-pixel display, 254 ppi compared to the 264 ppi 2048-by-1536-pixel display on the iPad. It’s also slightly thinner and lighter, making it easier to hold when reading or watching movies, as Amazon has a media ecosystem that rivals Apple’s in size, with the notable exception of apps. Perhaps most importantly, the Kindle Fire HD offers double the storage plus 4G connectivity at the same price as a Wi-Fi-only iPad. The $499 Kindle Fire HD 8.9-inch 4G comes with 32GB of storage and a 4G radio, while the same money buys a third-generation Wi-Fi iPad with 16GB of storage. In comparison, a 32GB 4G iPad costs $729. While Amazon boasts that $50 yearly pays for a 4G plan with 250MB of data monthly, this is hardly an advantage over the iPad, as the data amount is not suitable for streaming music or videos. If you put 4G connectivity aside, the Kindle Fire HD becomes an even fiercer rival to the iPad. A 16GB Wi-Fi-only 8.9-inch Fire HD costs $200 less than the comparable iPad, and even $100 less than the $399 iPad 2 Apple is selling (which costs $529 with 3G support). While Amazon might have the upper hand in pricing, which could sway a lot of consumers to its tablets, Apple is expected to introduce a smaller, cheaper iPad later this year. That could disrupt the waves Amazon and Google are making in the small tablet market.